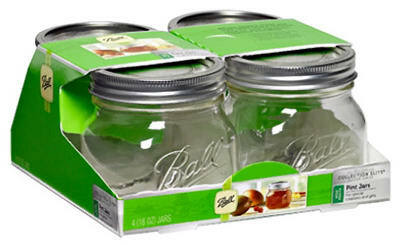 • Perfect for sharing, this jar has a contemporary style that is ideal for creative preserving and storing. • Elegant enough to take your flavored mustards, savory dressings, luscious chutneys and fruit-filled jams from the kitchen to the table, these uniquely shaped jars hold endless imagination. • Add a special touch to your signature creations. 4-Pk. 8-oz. platinum wide-mouth jars are elegant enough for flavored mustards, savory dressings, luscious chutneys and fruit-filled jams.